The excitement of the 2011 major league baseball season suddenly burst into supernova recently. It all began late Tuesday night in Atlanta. After the 3rd inning, the Pirates and Braves were locked in a 3-3 tie. Nobody managed to put across another run for the next 16 innings. They nearly played the equivalent of two full baseball games without scoring a run. I tuned into the MLB.tv feed around the 13th inning and the matchup just seemed far too boring so I skipped to a different game. Once I saw that they were headed to the 16th, I realized this could be something special. The kind of game where managers actually have to start putting their thinking caps on (both skippers confused their thinking caps with dunce caps, though, as evidenced by their long line of stupid maneuvers). The game got to the bottom of the 19th inning when things finally got interesting. The Braves put two runners aboard with one out. Julio Lugo, who I had only recently realized was still in the majors, stood at third base. The Braves had run out of position players so they let Scott Proctor, a crappy pitcher and an even worse hitter, step to the plate. He managed to make pretty solid contact but he hit a ground ball directly at the third baseman Pedro Alvarez. Lugo took off from third towards home plate and while Alvarez hurled a perfect throw to the catcher I remember thinking that this is one of the things I love to see in baseball, a tense moment with the game on the line and a fielder executing a perfect throw to home plate to keep the game alive. The throw home was perfect, alright. Pirates catcher Michael McHenry, a minor league scrub acquired from the Red Sox organization after a slew of Pittsburgh catchers started falling apart in succession, received the throw from Alvarez and met the oncoming Lugo a few feet in front of home plate. Lugo was out by a mile and he knew it. He didn't even try to bowl the catcher over or knock the ball out of his glove, he simply executed a feeble slide with a look on his face like he didn't want the catcher to be too rough with him. Perhaps McHenry sensed Lugo's hapnophobia because instead of firmly smacking him with the glove, he waved his arm in the vicinity of Lugo's leg. 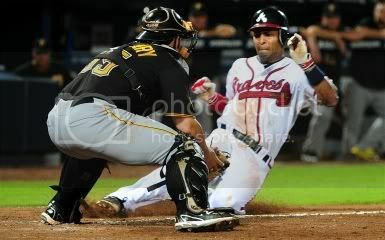 Lugo stood up from his slide with his body slumped into disappointment when suddenly the umpire gave the signal "SAFE!" and Lugo quickly touched homeplate. The game was over. And "the umpire" was about to lose his relative anonymity. The world of baseball-watchers exploded in anger. I've never enjoyed following the stream of Twitter messages as much as I did that Tuesday night (after 1 AM, mind you). Everybody had been tuning into the game because of how unusually long it was lasting, it seemed like there was a shot at history being made. Well, it was historic alright. Many people called it the worst call they'd ever seen in a baseball game. In retrospect, the umpire Jerry Meals apologized and admitted he messed up while some have argued that he may have actually made the correct call. Major League Baseball actually issued a statement saying that Meals screwed it up, but they can't take it back. They won't be bringing the two teams back together to re-do everything. It's in the books. Worst of all for the Pirates, who are contending for the first time in some 19 years, this could be the difference between them going to the postseason or not. All of that stuff was going on around 2 AM eastern time and so the next day figured to be filled with all kinds of reactions once everyone got to gather their thoughts on the incident. Well, a huge wave of Wednesday baseball action suddenly splashed, overtaking and washing away all the Jerry Meals news that had begun to pile up. With the trade deadline looming, the newswire had begun to buzz with big news: the St. Louis Cardinals were going to trade their young stud centerfielder, Colby Rasmus. The 24-year-old Rasmus, although a world class talent, had been squabbling with the team's manager last year and it spilled over into this season with Rasmus having a bad year to show for it. It certainly didn't help Rasmus' standing with the Cardinals that his father had the attitude of a big-mouthed little league dad constantly interfering with the team's handling of his son. Better yet, it was the Toronto Blue Jays' shrewd young general manager who was swooping in to grab Rasmus and bring him up to the nest in Toronto along with a bunch of other rejected fledglings. While baseball peeps were still assimilating these two huge events, an afternoon baseball game in Cleveland between the Angels and Indians suddenly demanded everyone's attention. Angels righthander Ervin Santana was pitching a no-hitter. Once everybody (including me, via my iPhone) managed to tune in, Santana cruised through the last two innings and history was made. Suddenly, nobody gave a crap about Jerry Meals.